In my book Find the Lost Dollars: 6 Steps to Increase Profits in Architecture, Engineering, and Environmental Firms, I conclude with a final chapter that outlines the six steps that can guide you towards increasing your firm’s profitability. This article will summarize that chapter, as well as give you some success principles for ensuring that desired changes and improvements do not lose their momentum and die before being implemented. Change is inevitable and necessary in all businesses. If you are not able to adapt to changes in the economy, marketing, technology, and availability of human resources, you will find your profits dwindling, and your ability to retain your most talented employees diminished. So then why do 70% or more of most change initiatives fail? I argue that the foremost reason that A&E firms fail to grow and improve business operations is lack of a detailed strategy and plan to improve. This article will summarize the six steps that can help you start to identify and implement business improvement initiatives to help you find and recover the lost dollars in your business. 1. Calculate your metrics – In order to understand your baseline – where you are starting from now – you will need to calculate some key financial metrics. I recommend ‘keeping it simple” by focusing on three metrics – your Win Rate, Utilization Rate, and Project Profit Margin. These three metrics, when measured and focused on intently, give you the core measurement of your firm’s success. By focusing on just three, you can more easily educate your project managers, and start to hold them accountable each month. Now that you know your baseline metrics, how much would a 1% increase in each of these metrics mean to your firm? The next step involves calculating a 1% improvement in each metric, and determining which area will give you the biggest Return on Investment (ROI) to address. Another benefit of going through this exercise is really understanding your numbers better. Many firm leaders and managers are very surprised at how such a small increase can equal such a large amount. I recommend that after calculating these numbers, you set some goals for your firm to pursue in the coming year. In this step you will do some deep analysis to understand what is really going on in your firm every day. 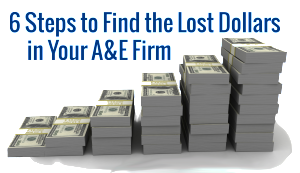 In Find the Lost Dollars, we look at nine areas where most A&E firms lose money and how small changes of just 1% can be substantial increases in revenue and profits. To assess your business management practices, you will evaluate each of the nine areas of your business, broken down into People, Process, and Systems, and determine where money is getting lost or revenues are not being maximized. I recommend that you do this by surveying your staff, and asking detailed questions about where bottlenecks, inefficiencies and lack of processes are holding them back from optimal performance, as well as where systems are not supporting them. You will also want to try and uncover where employees need more training, or are not following established processes intentionally. Check out our automated tool – The Find the Lost Dollar Business Management Assessment – to quickly get detailed insight into where your employees are struggling and processes and systems are failing to support their work. Having an anonymous way to collect your employees’ feedback, comments and suggestions for improvement is a great place to start getting your staff on board for making needed improvements to your business and project management practices. if you have gotten to the point where you understand the financial impact of making business improvements, and have identified where the money is leaking from your business, then congratulate yourself – you are much further along than the average firm! After going through the process of analyzing your business, you may have discovered some surprising, and some not so surprising things that are going on every day that are causing your firm to lose money. Now you must analyze the feedback and “scores” you have received from your staff to determine where to focus your attention for business improvement. I recommend that you make a list of your top initiatives, put them in order of priority, and determine who will be responsible for undertaking each project, and realistic due dates for each one. There may be a tendency to try and want to “fix” everything at once, but realize that by attacking one problem at a time, with a comprehensive strategy and plan, you will have a higher likelihood of success, and be able to keep your teams focused on the outcomes. This step is the most time consuming part of this business improvement process, and where many firms fail. This step requires real action and determined execution of the plan that you developed in step 4. Real success in improving your business will involve change management best practices including excellent communication with your entire staff, determining specific desired outcomes and measurable goals, and holding people accountable. Most of our clients that take the assessment find that there are many related areas that need to be addressed to find lost dollars. The first step in each area usually involves getting your teams educated, focused and motivated to change and improve. Our Find the Lost Dollars Business Management Training Program provides a fast, convenient and affordable way to transform your technical staff into business savvy leaders. If you have made it this far, then you should be starting to see measurable improvements in your business. The last step is to continue to measure your metrics on a monthly or quarterly basis and track improvements as you implement the changes. In most cases you should start to see measurable increases in your metrics in one year or less. This is really the easiest step in this process – sit back and watch all of your hard work pay off! This process should not end after a year or when all of your initiatives have been completed. A culture of continuous improvement, fueled by feedback from your employees and clients, will help to ensure that your firm continues to grow profitably and have a competitive edge. By going through this assessment and improvement process once a year, you will continue to see improvements to the bottom line, as well as more enjoyment from your staff every day. 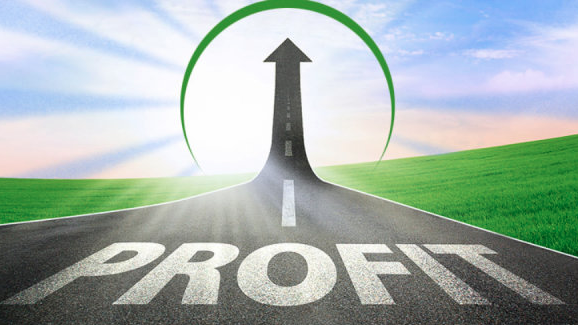 I invite you to learn more about my 6 Steps to Increase Profits in your A&E firm.